Earlier this month, a Philadelphia jury ordered drug makers Johnson & Johnson and Bayer to pay $28 million to an Indiana plaintiff in the state’s first Xarelto trial. Jurors concluded that the pharmaceutical giants, which developed the blood thinning medication jointly, failed to adequately warn consumers about internal bleeding risks. The Xarelto lawsuit was the first bellwether case heard in the Philadelphia Court of Common Pleas, and is also the first trial loss for the defendants, which have prevailed in three bellwether federal cases tried in Mississippi and Louisiana. The companies still face more than 20,000 Xarelto lawsuits filed by people who suffered life-threatening and fatal GI bleeds from the blockbuster anticoagulant. According to her lawsuit, Hartman was prescribed Xarelto in 2013 to mitigate potential health problems associated with atrial fibrillation (AF), an irregular heartbeat that can cause blood clots, pulmonary embolism, heart failure, stroke and other complications. After taking the blood thinner for a year, Hartman was hospitalized for a life-threatening gastrointestinal bleed, a dangerous side effect she contends was not fully advertised. Hartman was taken off Xarelto and eventually recovered from her injuries. Hartman and her husband were awarded $1.8 million in compensatory damages and a whopping $26 million in punitive damages, according to their attorney. As is expected in such large judgements, Bayer stated that it plans to appeal the decision, arguing there was no basis for such a massive punitive award. J&J’s Janssen unit also plans to appeal the judgement, stating that it contradicts scientific data that confirms the safety of Xarelto. The Hartman case was the first of 1,540 Xarelto lawsuits currently pending in the Philadelphia state court, which has a reputation for plaintiff-friendly juries. The court’s Complex Litigation Center has handled several noteworthy mass torts, including Risperdal and asbestos claims. Last year, Xarelto sales generated $3.2 billion for Bayer, and the blood thinner continues to be the manufacturer’s best-selling product. Bayer and J&J continue to stand behind the safety of the blood thinner, which is prescribed to some 31 million patients across the world. 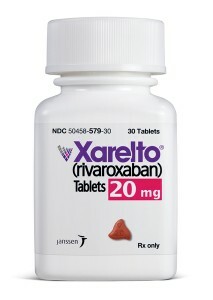 Unfortunately, internal bleeding episodes caused by Xarelto are not easily treated, as there is no antidote that will stop its anticoagulant effects. Plaintiffs who suffered GI bleeds and other catastrophic side effects from the medication have leveled claims of strict liability, design and manufacturing defects, negligence, breach of warranties and negligent misrepresentation. Lawsuits concerning Xarelto bleeding have been centralized on the state and federal level, with the next bellwether trial in Xarelto multidistrict litigation 2592 slated for January of 2018.